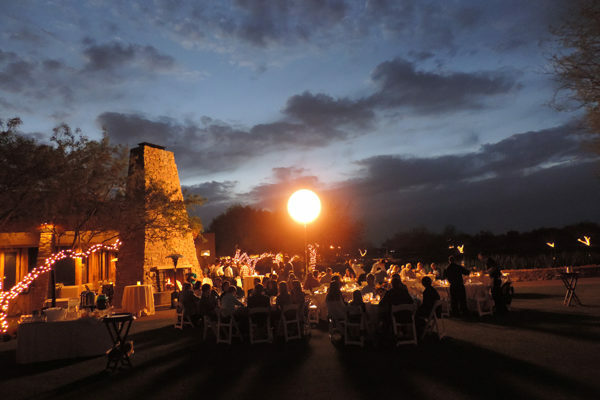 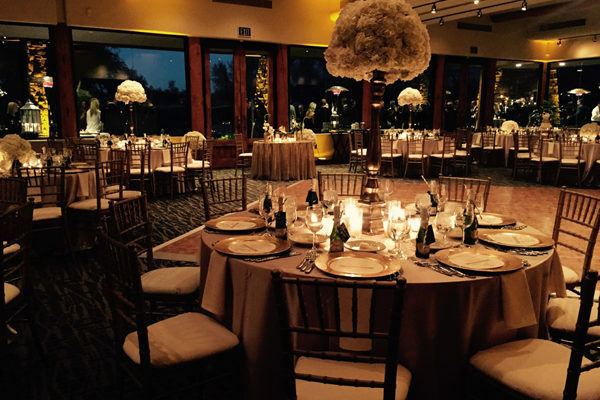 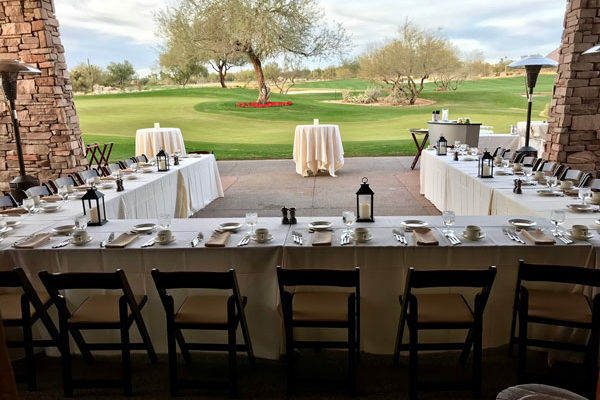 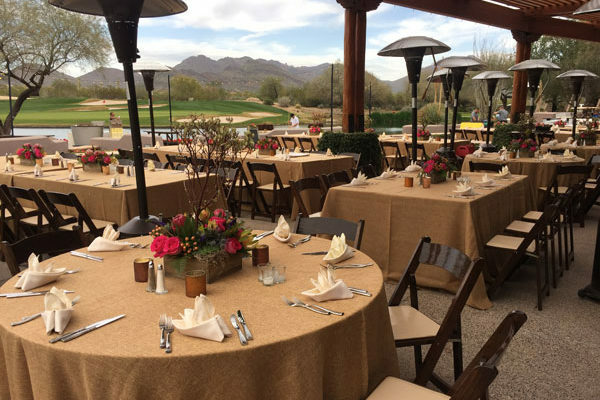 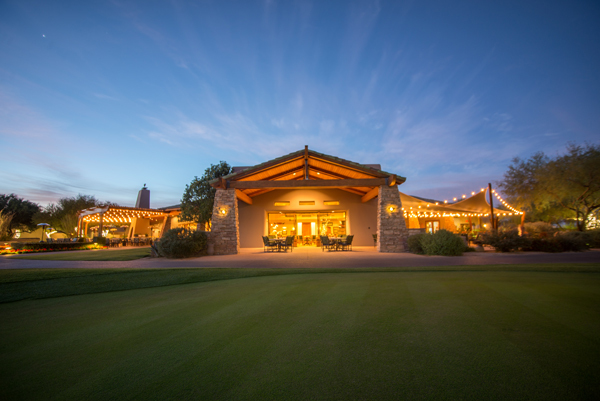 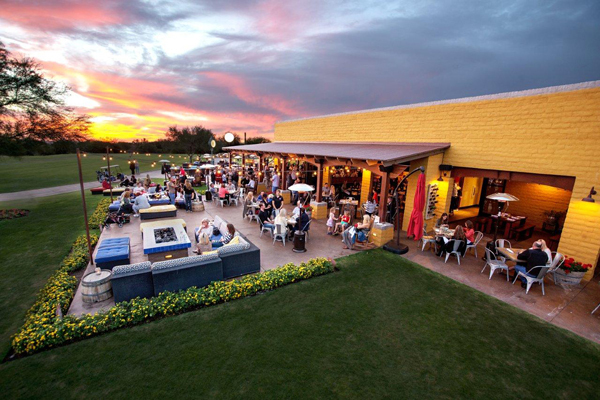 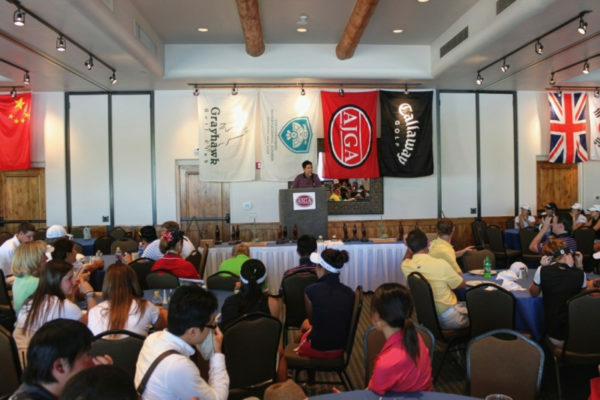 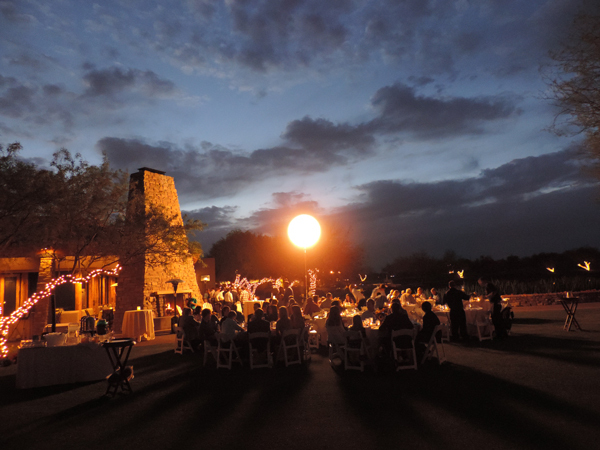 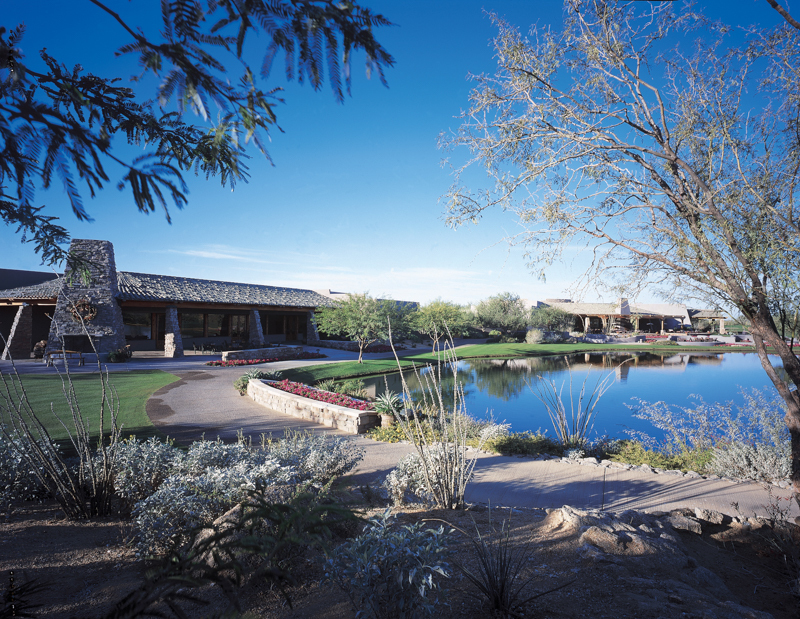 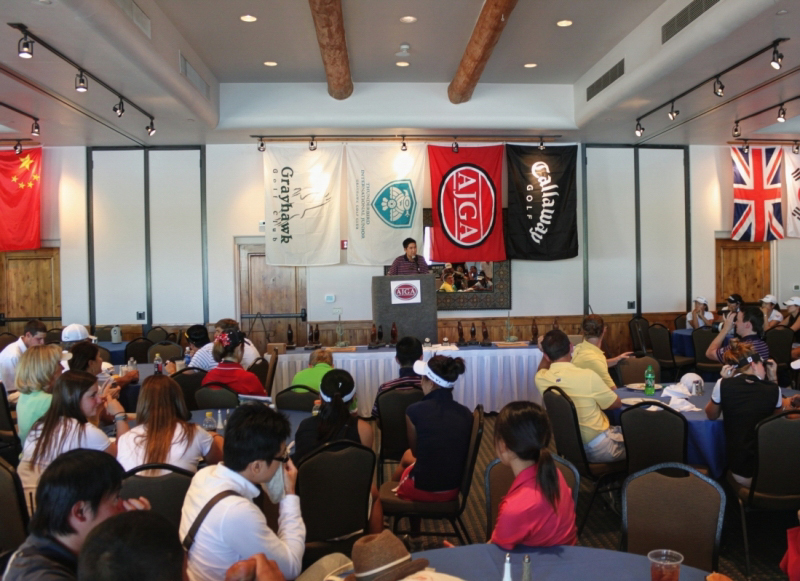 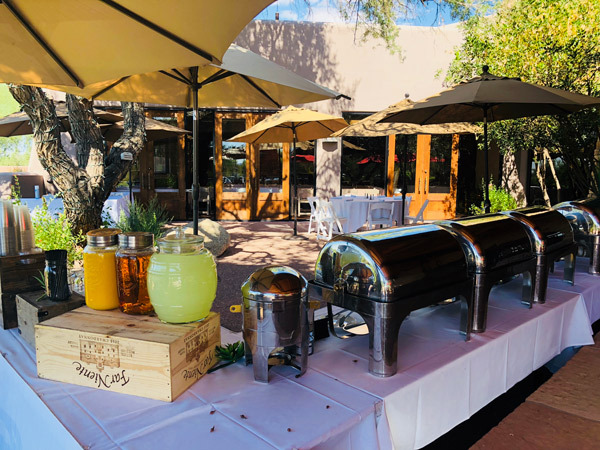 The clubhouse at Grayhawk Golf Club offers several locations to host gatherings of all varieties, one of which is certain to capture the spirit of your special occasion. 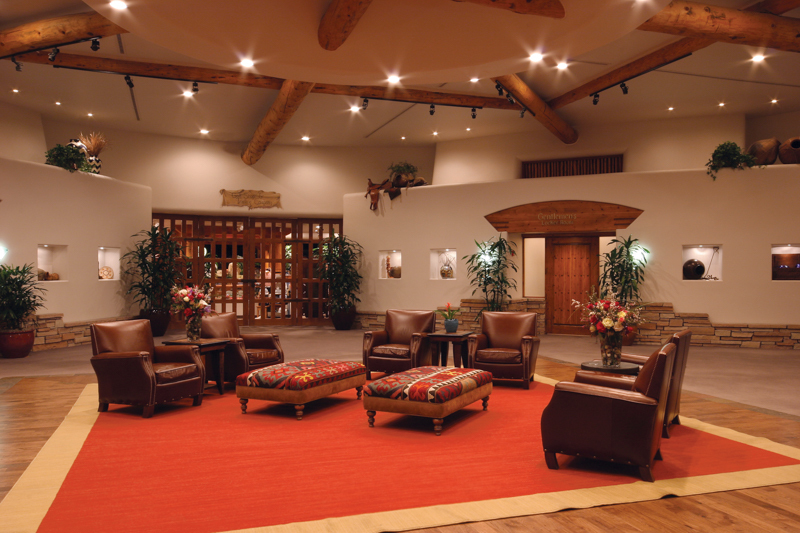 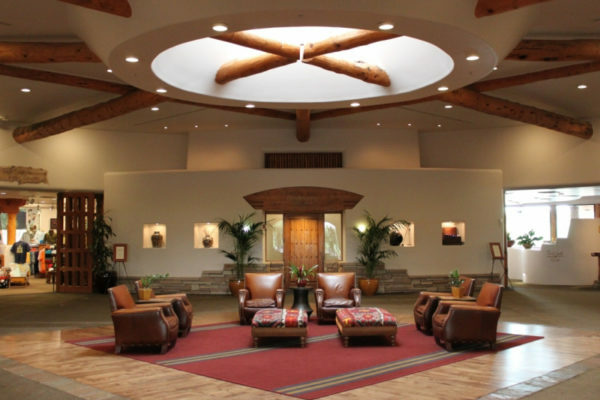 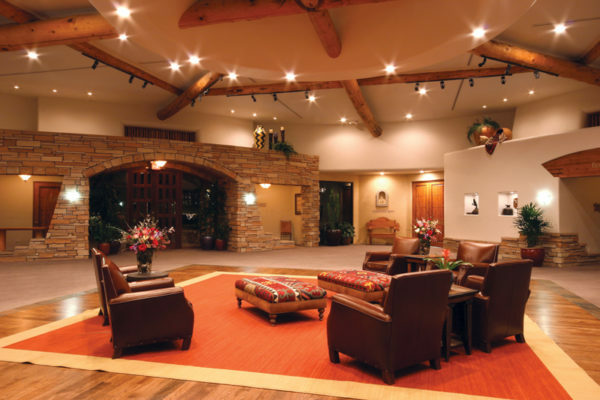 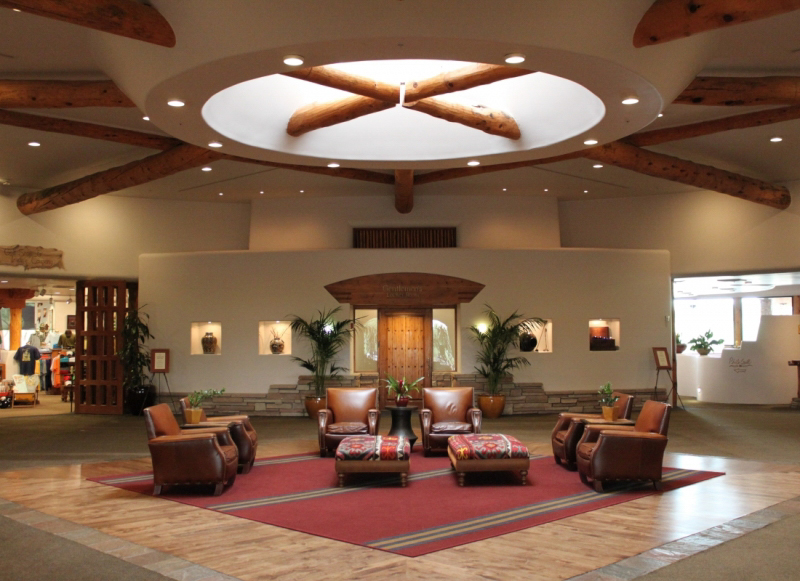 Each location has its own distinct charm and all rooms radiate a warm and elegant Southwestern feel. 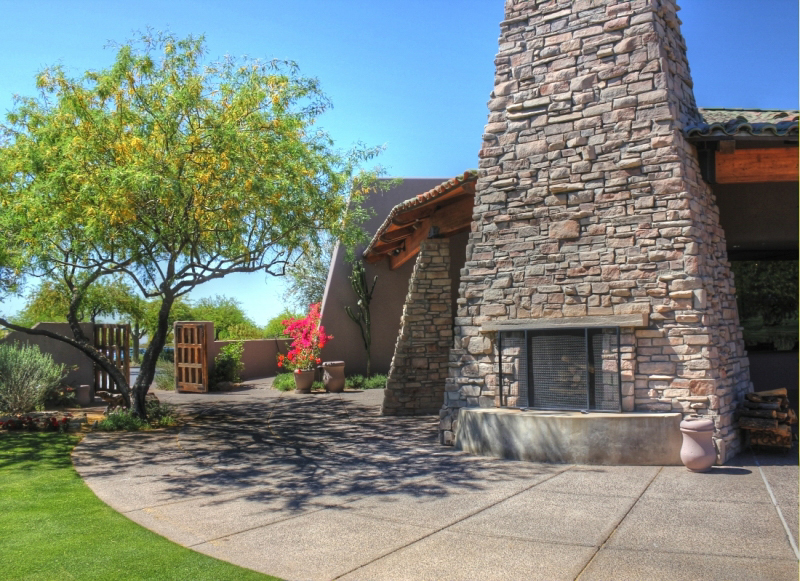 After you’ve had a chance to view the options online, be sure to stop by and take a personal tour to see for yourself. 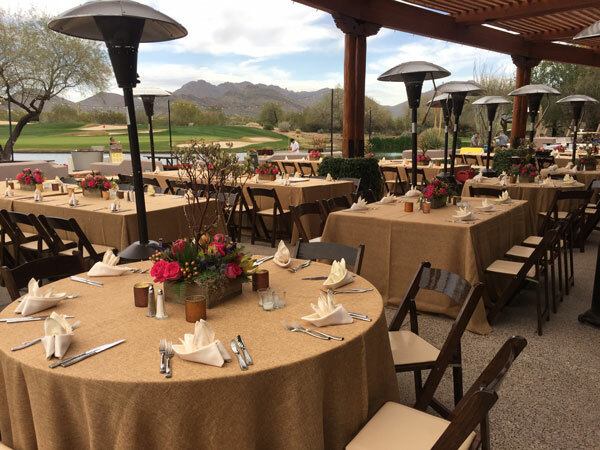 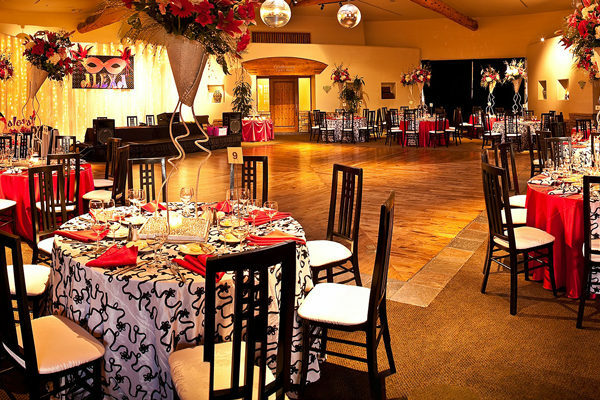 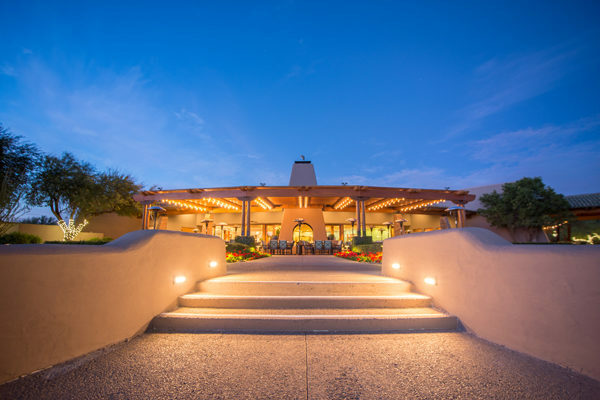 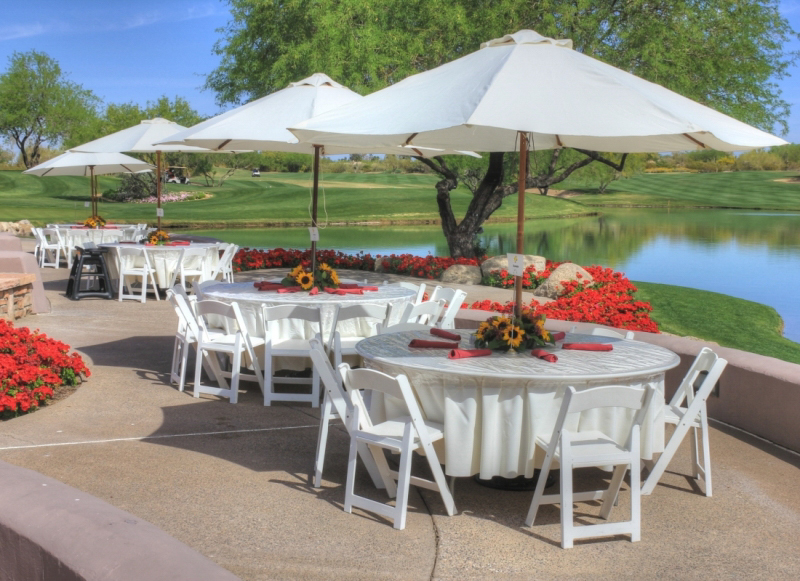 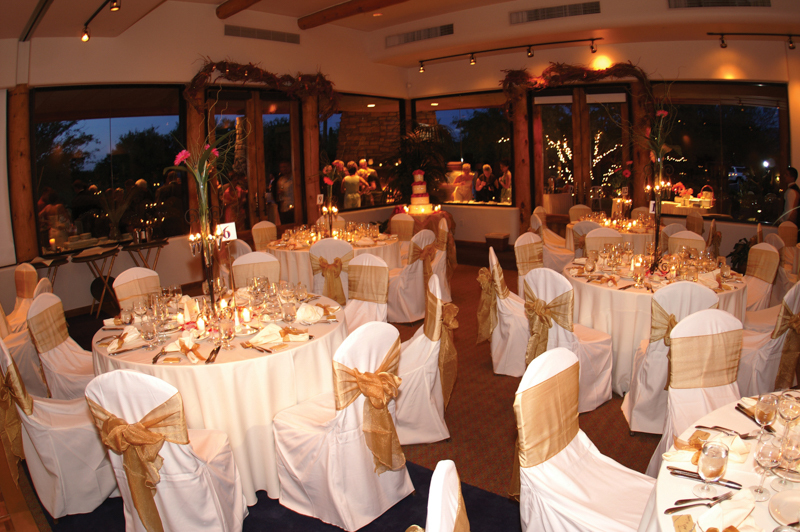 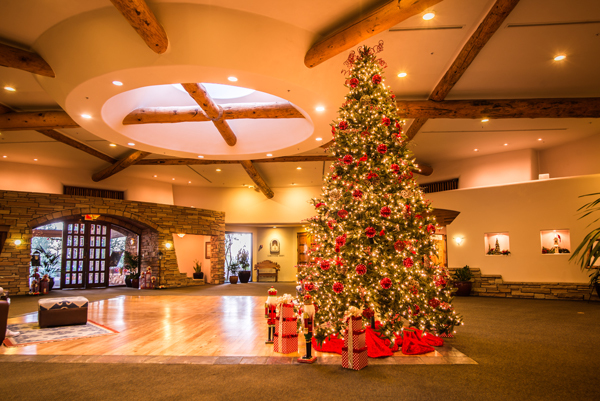 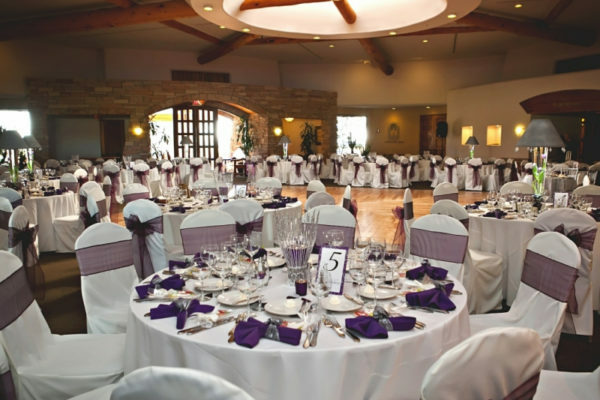 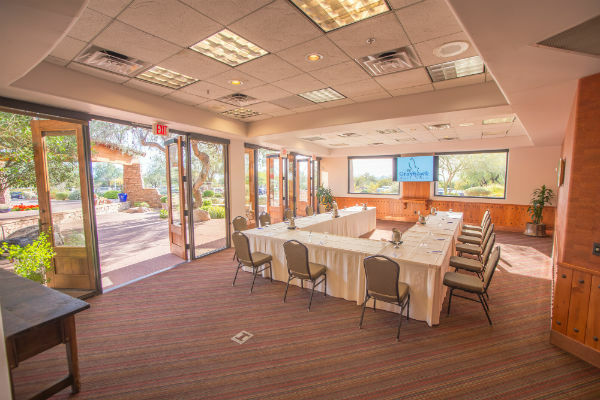 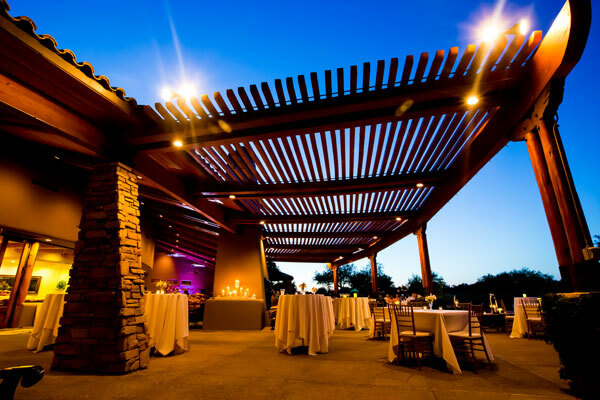 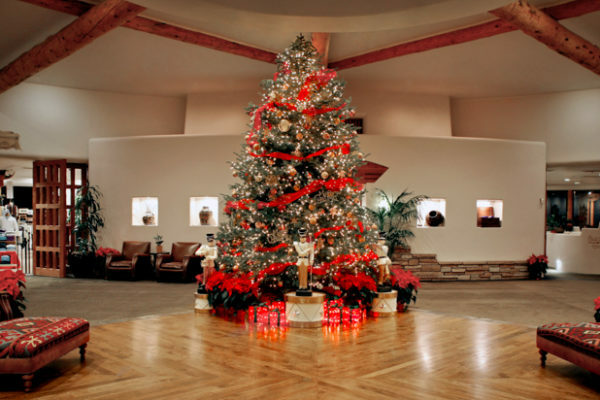 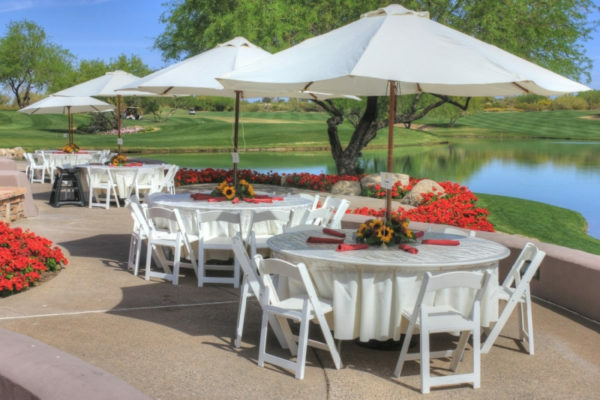 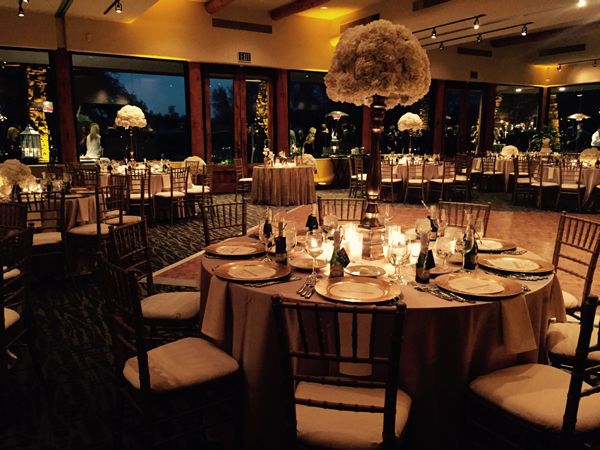 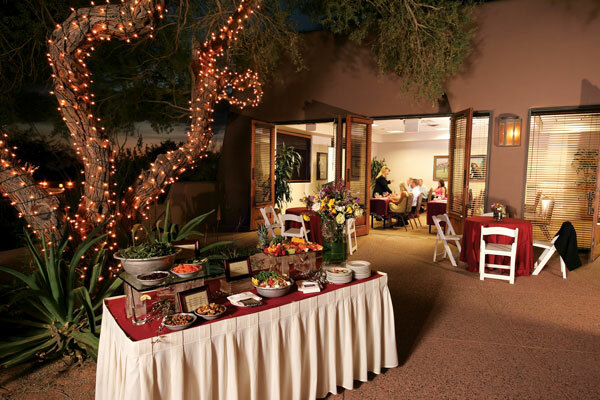 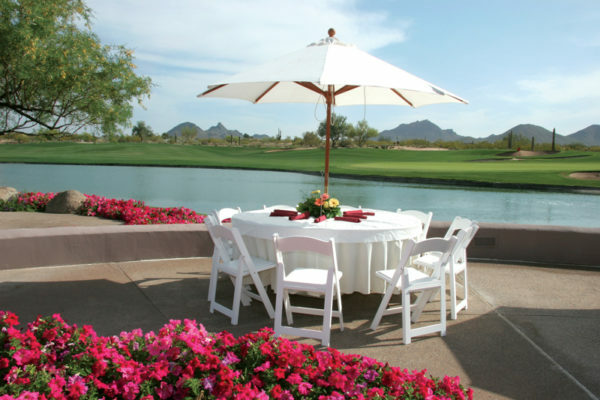 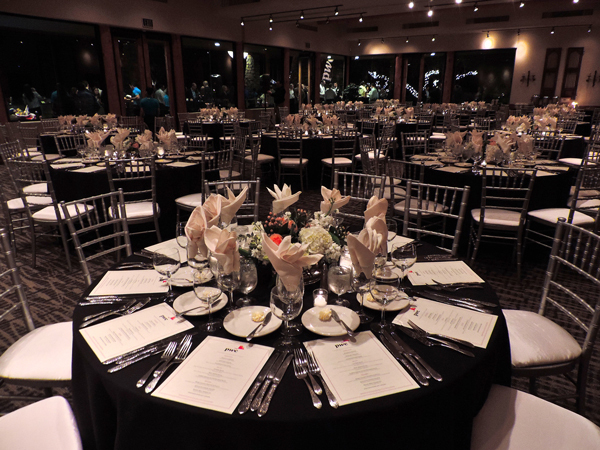 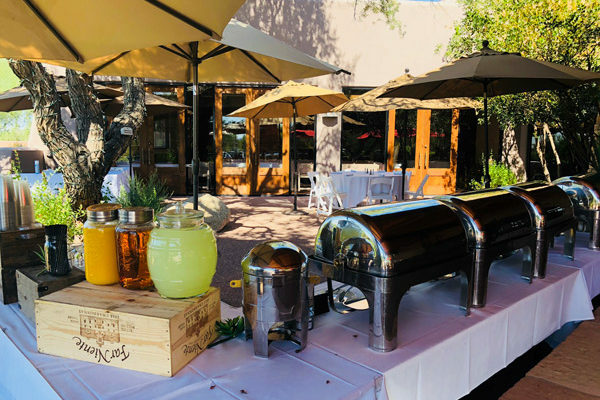 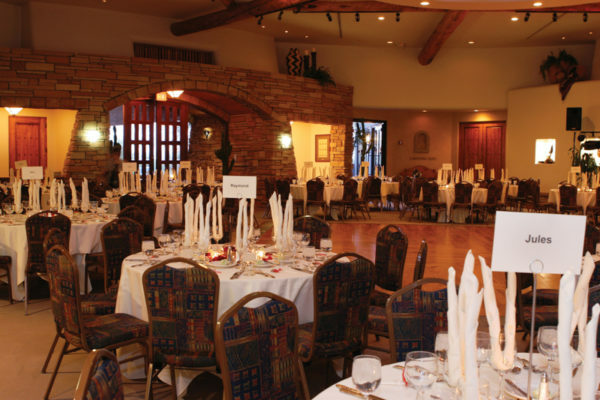 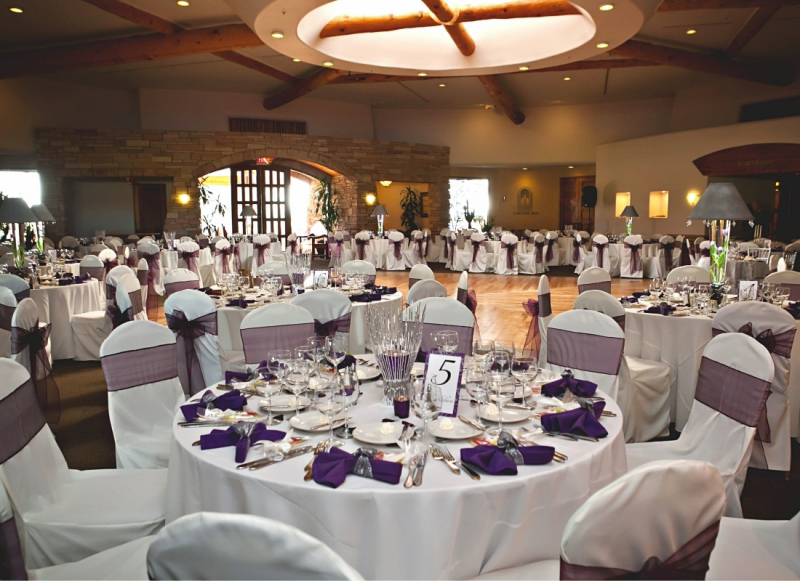 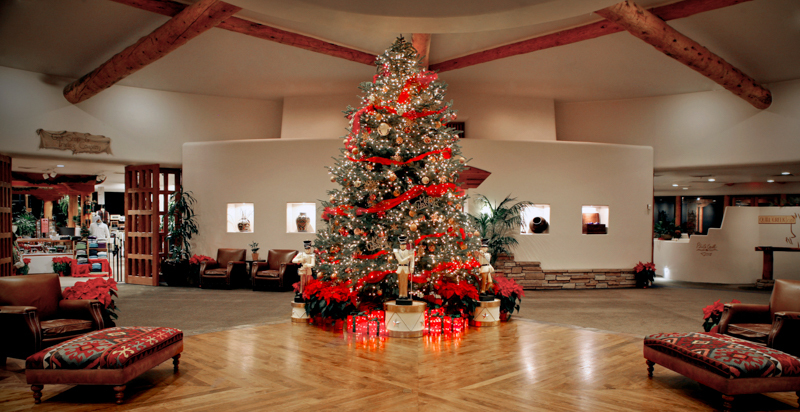 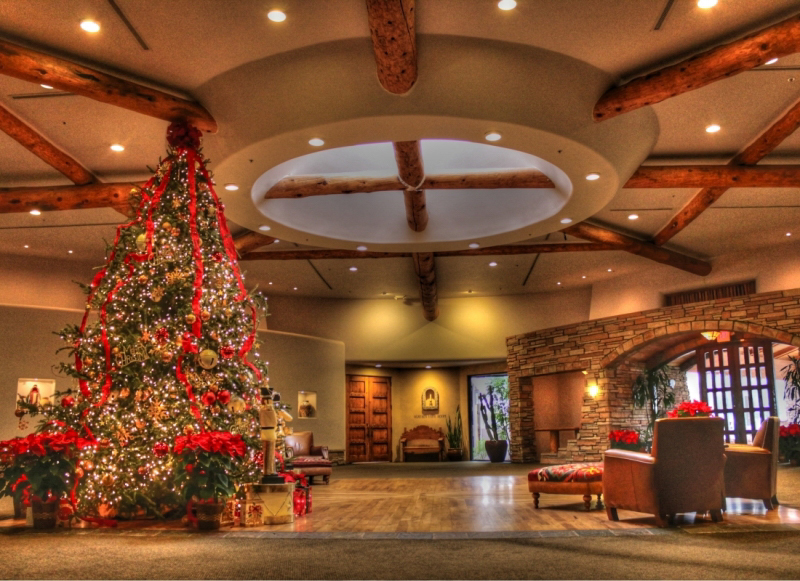 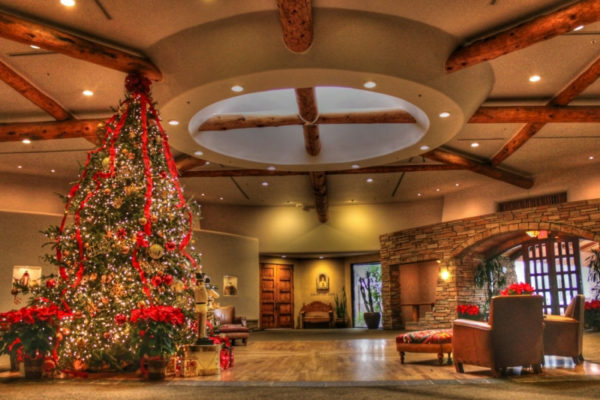 The crown jewel in the Grayhawk’s special event spaces, the Fairway House offers 6,000 square feet of meeting and reception space (combined indoor and outdoor) designed to accommodate groups of 20 to 300 people. 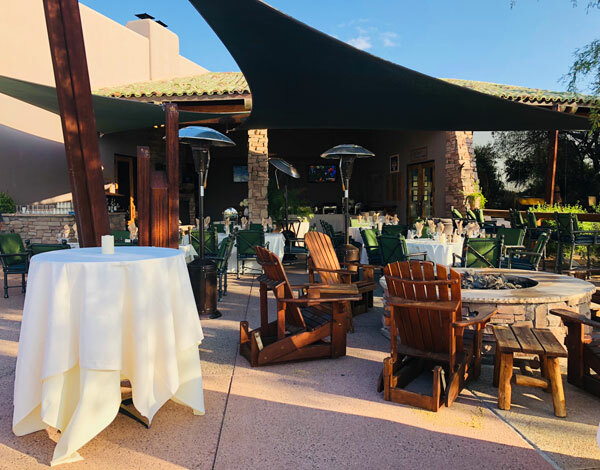 On the other side of the expansive picture windows lies a large patio with an outdoor fireplace and neatly manicured event lawn that dresses up spectacularly as an outdoor wedding chapel. 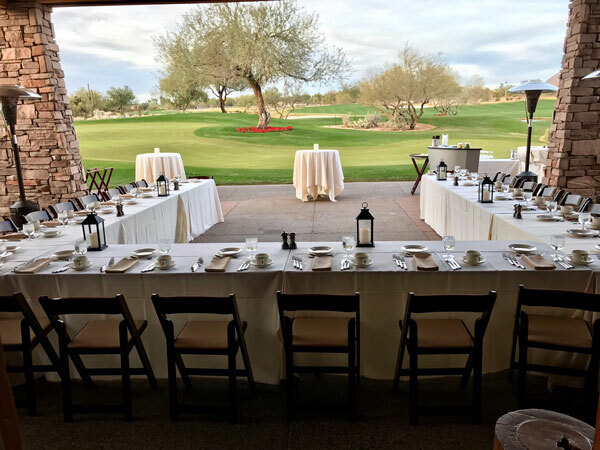 The Fairway House’s indoor/outdoor capability takes full advantage of Arizona’s excellent weather and provides breathtaking views of Grayhawk’s Raptor course, the McDowell Mountains and Pinnacle Peak. 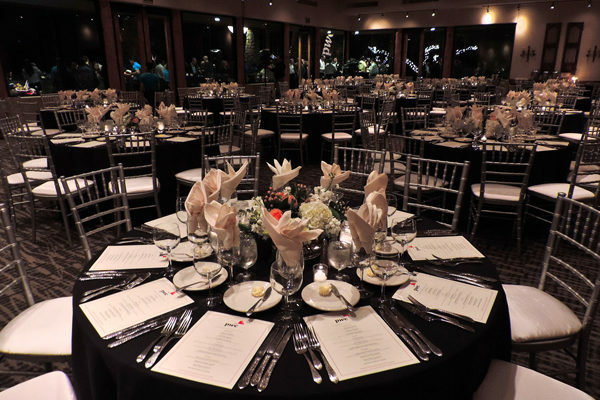 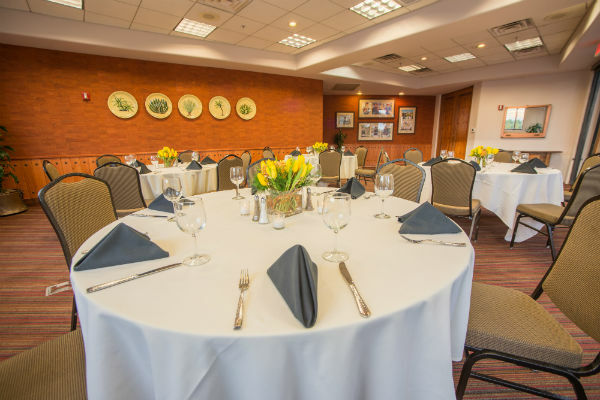 To ensure that we not only meet but exceed your expectations, a complete kitchen, chef and event staff is exclusively dedicated to the Fairway House. 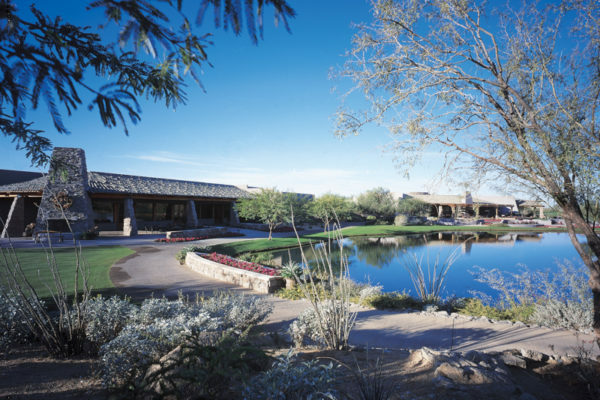 People are drawn to Scottsdale to enjoy the wonderful weather; the clubhouse at Grayhawk was designed with this in mind. 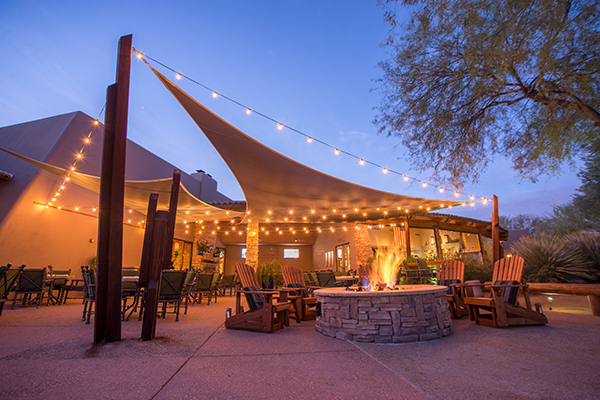 Several patios ranging from private pockets to grand outdoor living spaces surround the exterior, most of which are complemented with roaring fireplaces that warm the crisp desert air. 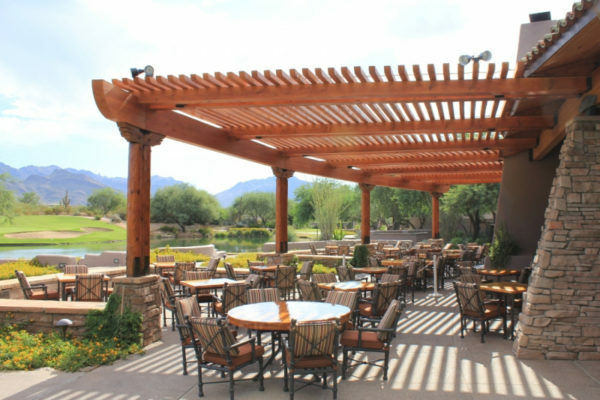 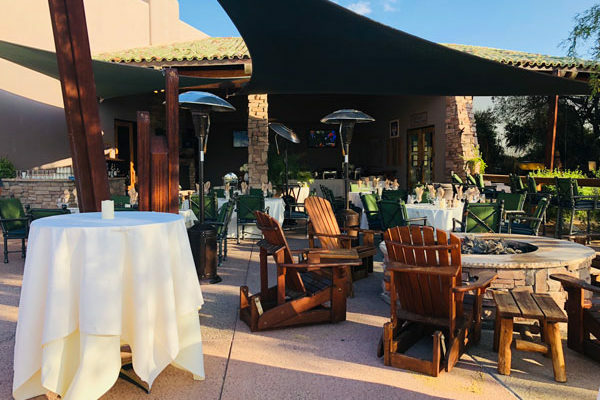 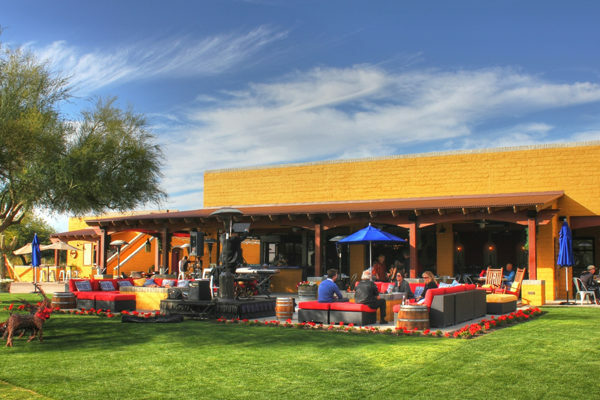 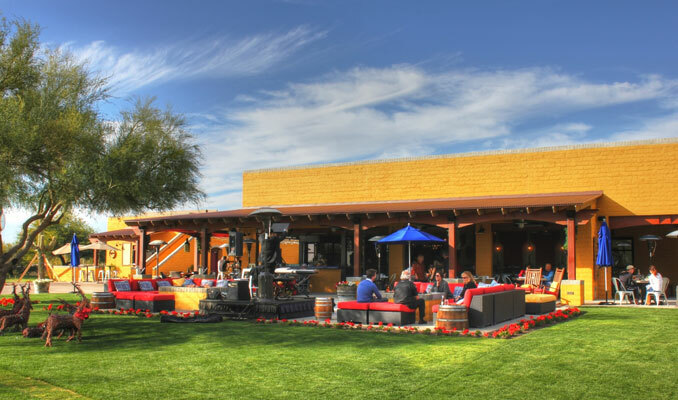 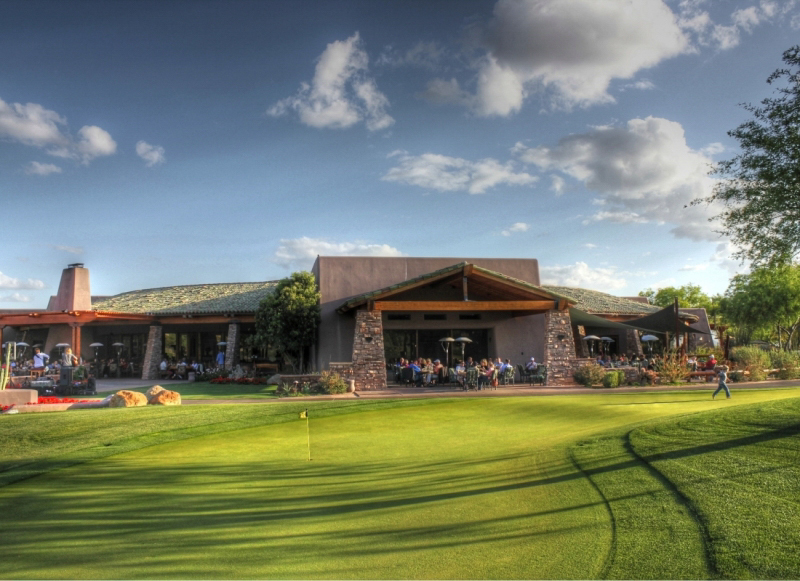 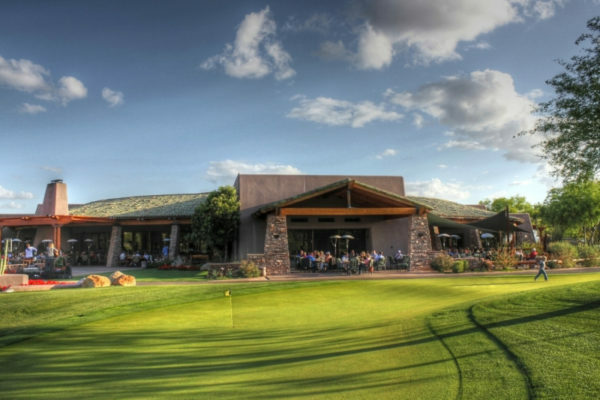 For example, the Quill Creek Café patio is the ideal location to watch the action on the 18th green of the Raptor course as well as take in the views of the nearby McDowell Mountains. 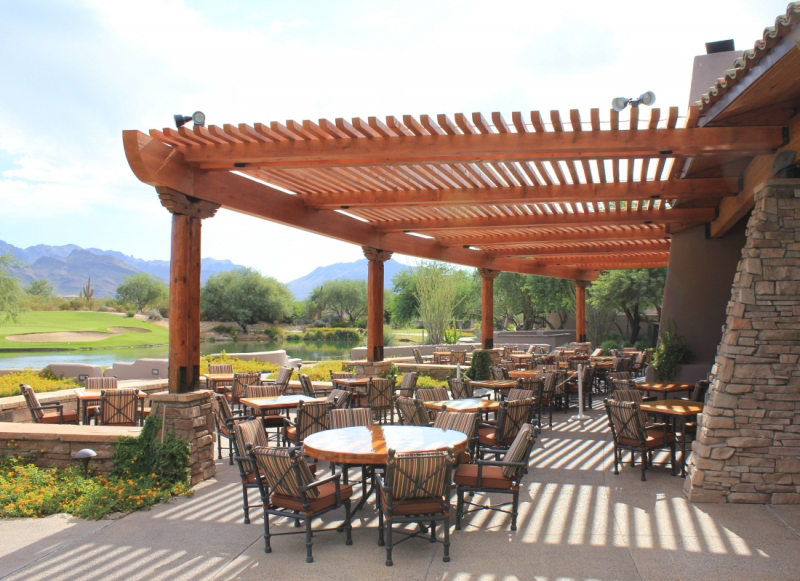 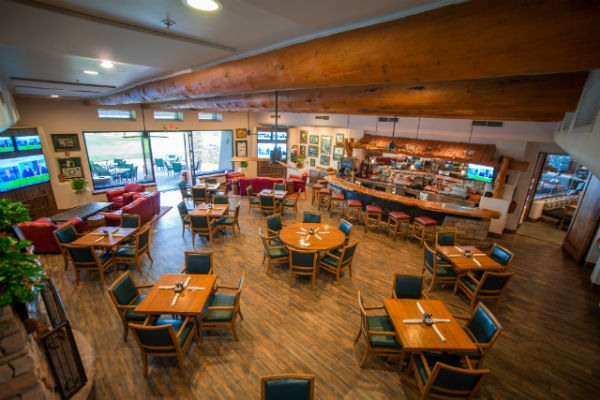 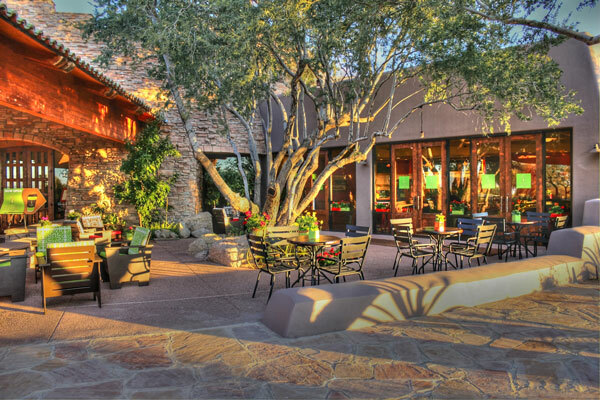 In addition to an eclectic menu of mouthwatering fare, the Quill Creek Café features striking views of the majestic McDowell Mountains and the sparkling lake. 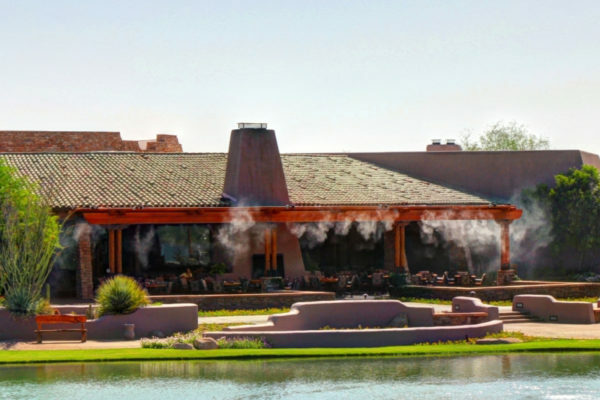 The Southwestern-inspired dining room is accented by white stucco, wood beams, large picture windows and hardwood table tops. 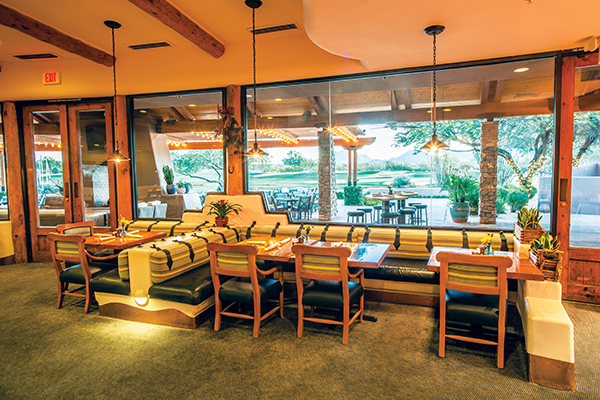 The dining room at Quill Creek Café opens to a large patio. 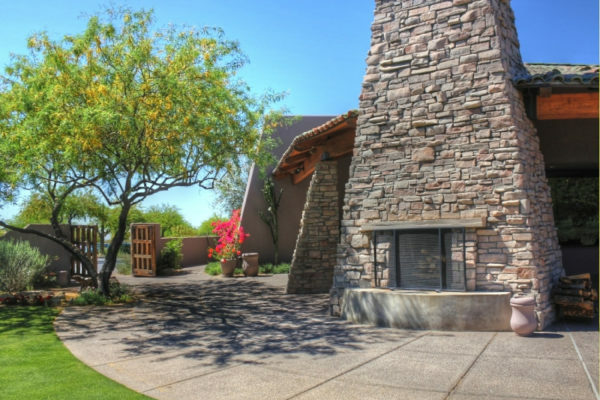 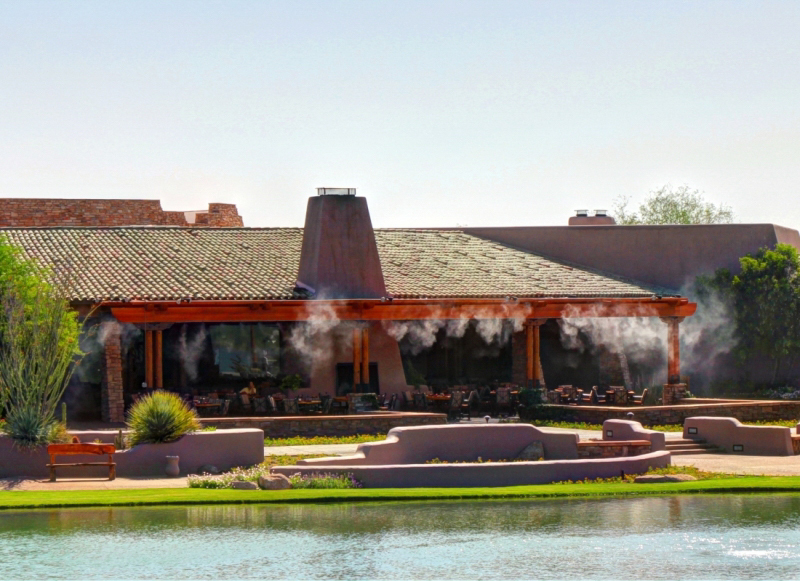 The flicker of two enormous fireplaces radiates a warm rustic feel, and space heaters and a misting system allow for outdoor enjoyment on the rare occasion when the Arizona weather is uncooperative. 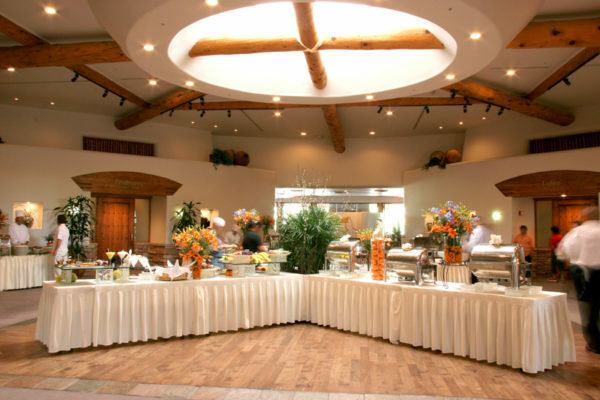 The Quill Creek Café patio is available for sit-down or buffet-style services for up to 200 guests. 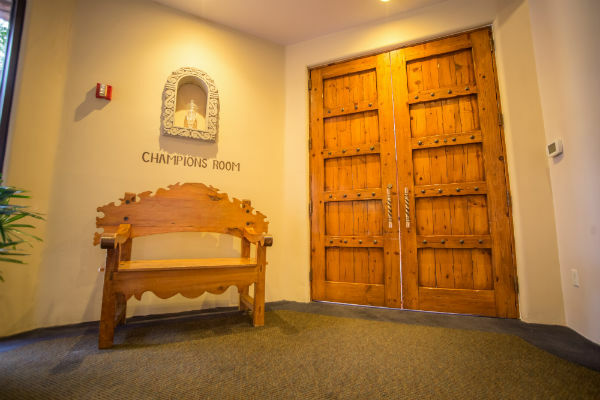 The McDowell Room makes a grand statement from the minute you enter through the gigantic timber-accented awning akin to that of a luxurious alpine lodge. 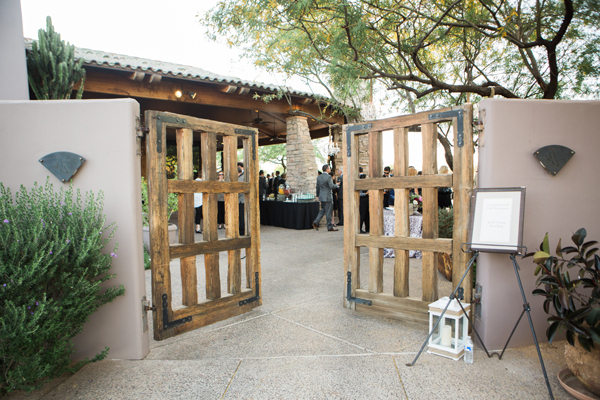 Two king-sized, hardwood doors swing open to reveal the McDowell Room with its vaulted ceilings, timber beams, stone slate accents and a hardwood dance floor. 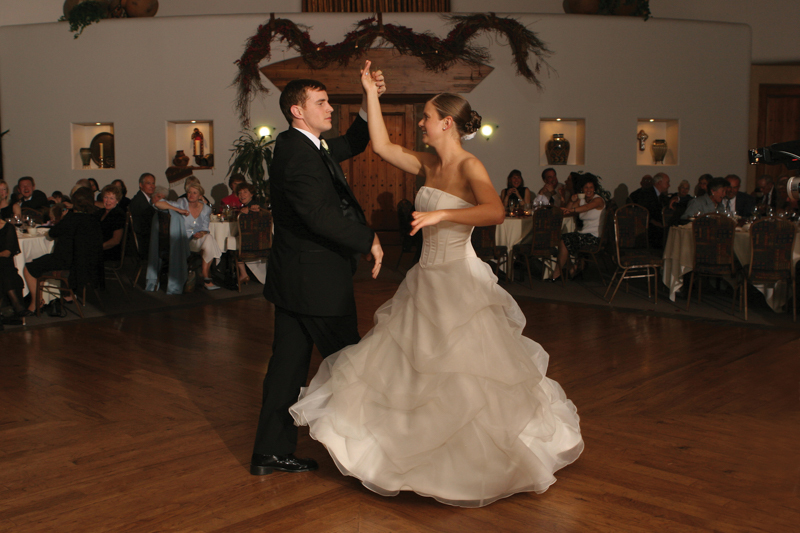 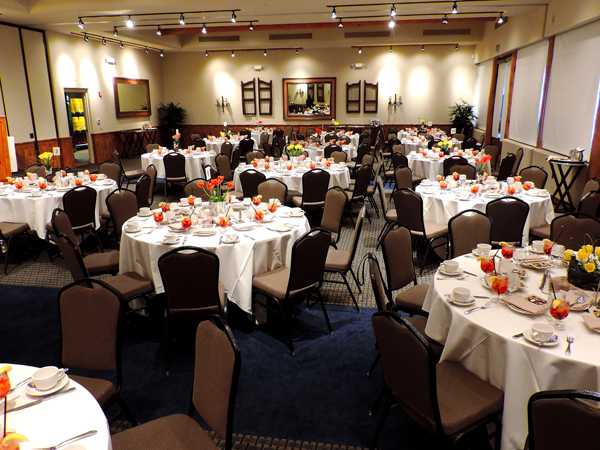 Built to impress, it’s a perfect location for sit-down dinners and receptions of up to 180 guests. 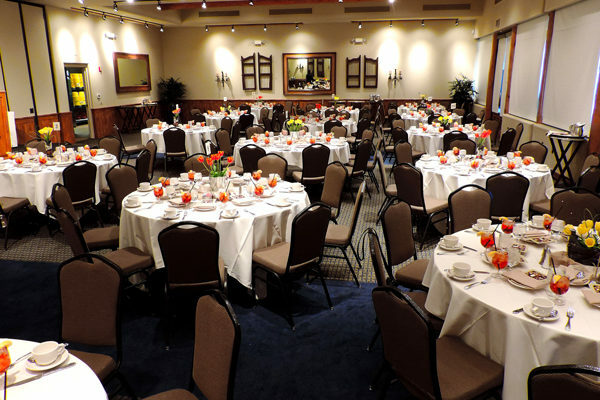 The Champions Room can accommodate up to 30 people in seating arrangements such as a U-shape, hollow square, theater-style or classroom-style. 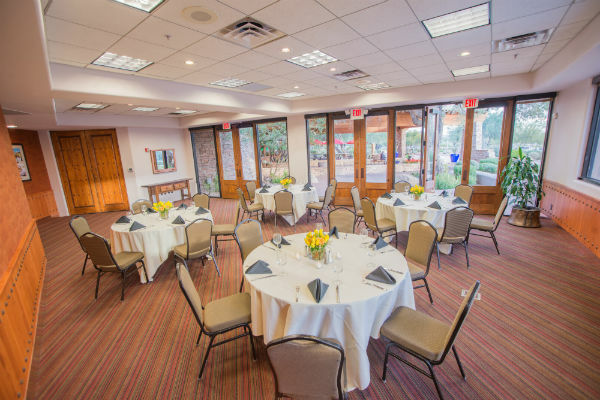 The Champions Room opens through French doors to a cozy Southwestern-style patio also has a patio with picturesque views of the Valley. 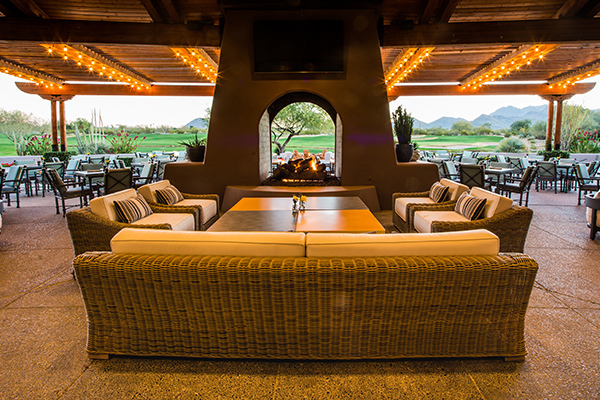 Phil’s Grill patio, named after PGA TOUR professional and Grayhawk Ambassador Phil Mickelson, offers breathtaking views of the Raptor course. 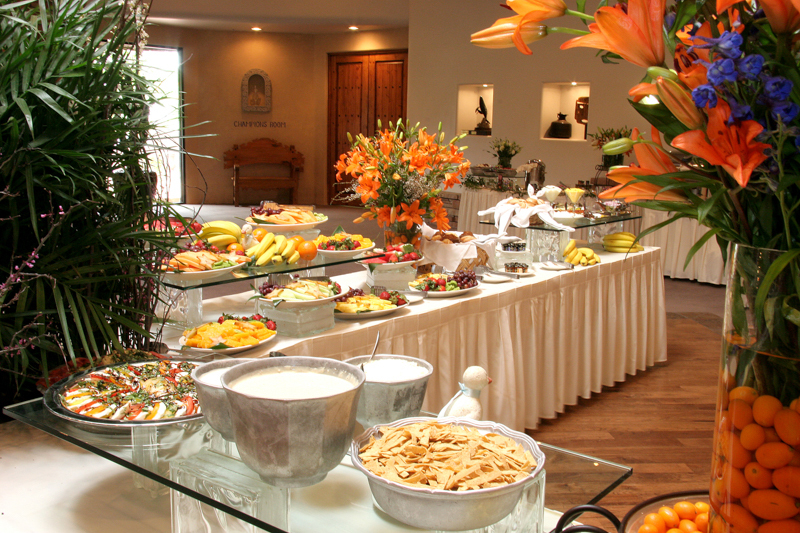 Its unique setting is perfect for small buffet gatherings of up to 40 guests. 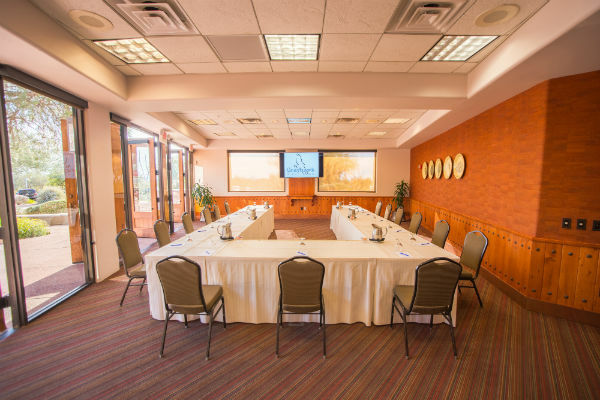 The Board Room is perfect for more intimate meetings or dinner parties of up to eight guests with a luxurious and warm ambiance that includes a hardwood roundtable and rich accents.